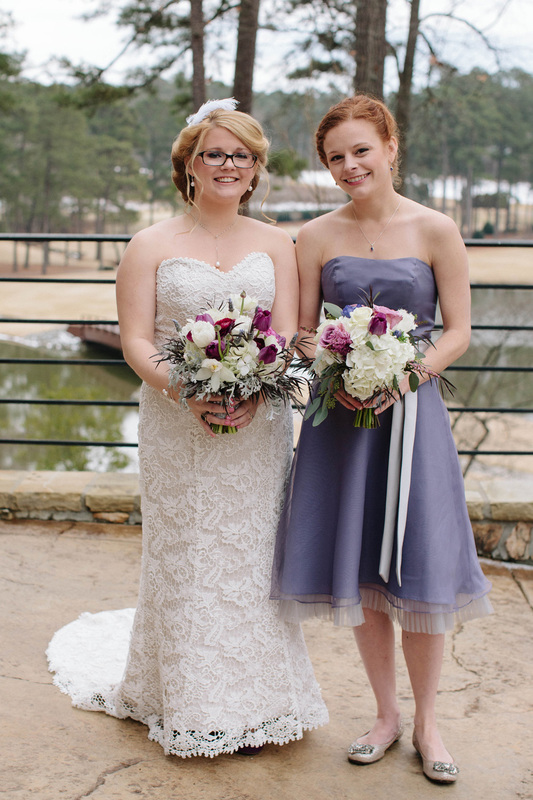 I had the pleasure to create floral designs for Leigh and Brian’s February wedding. 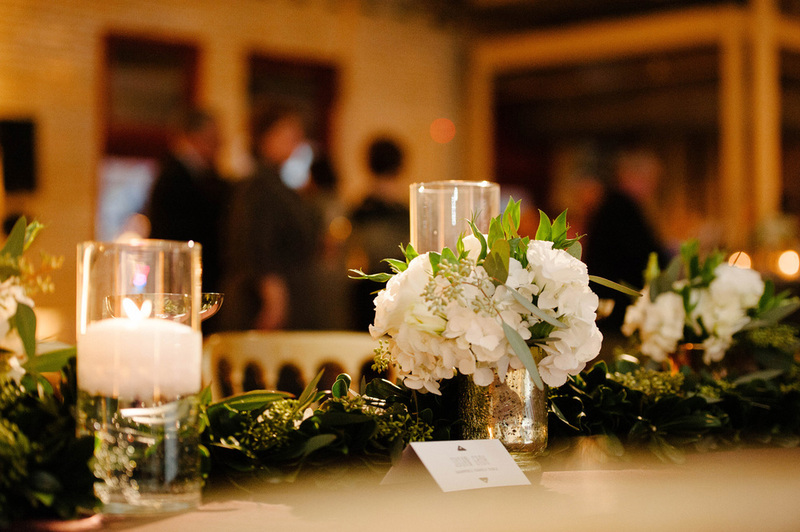 Leigh and Brian wanted a winter wedding with a bit of a formal New Orleans flair. We did the flowers for their rehearsal dinner as well at the ceremony and reception, which provided a nice opportunity to creatively re-use the rehearsal dinner flowers at the reception. When guest entered Cobblestone Hall, branch dividers blocked the direct view of the side bar and gave a taste of what was to come. The branch divider was lit from inside of the base and the branches were adorned with white dendrobium orchids and purple mokara orchids. This decorative wall brought attention to the grand entrance where servers greeted guest with drinks upon their arrival. 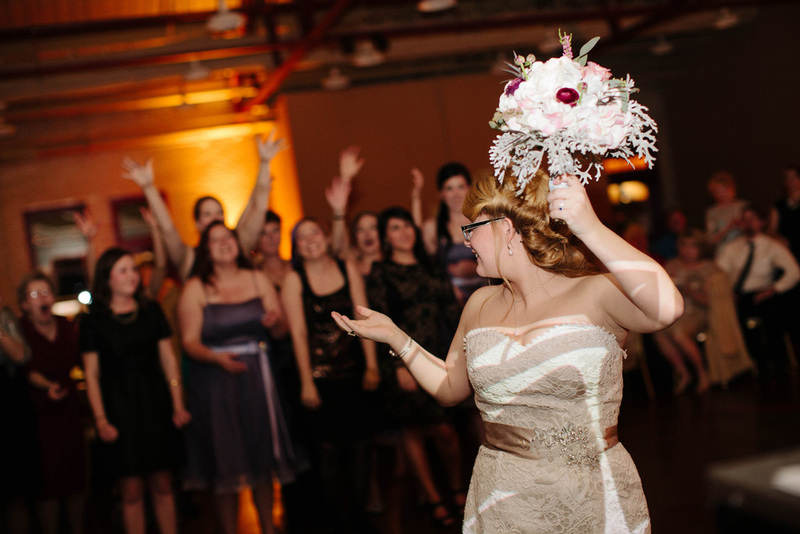 As you moved from the hot chocolate station to the photo booth/guestbook area, there was a series of 48” round tables. These smaller dining tables contained a mixture of black lantern arrangements, mercury glass composite arrangements as well as floating and votive candles. Moving beyond this area was a special family area, which consisted of two 4x8 tables that flanked the sweetheart table for the bride and groom. This area was centralized with the dance floor to the one side, and the cake table and food stations on the other side. 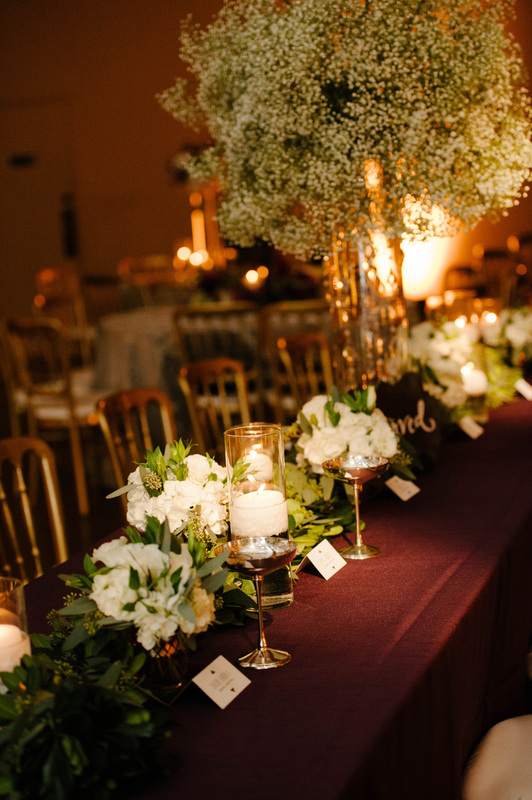 Each of these tables were dressed with a “snow mound” pillar of baby’s breath, with eucalyptus and winter greens among multi-height glass pillars containing floating candles in “snowy water” and white hydrangeas. This is also where we were able to re-purpose some arrangements from the rehearsal dinner. Surrounding the dance floor was cocktail tables with simple small arrangements and votive candles that were also from the rehearsal dinner. 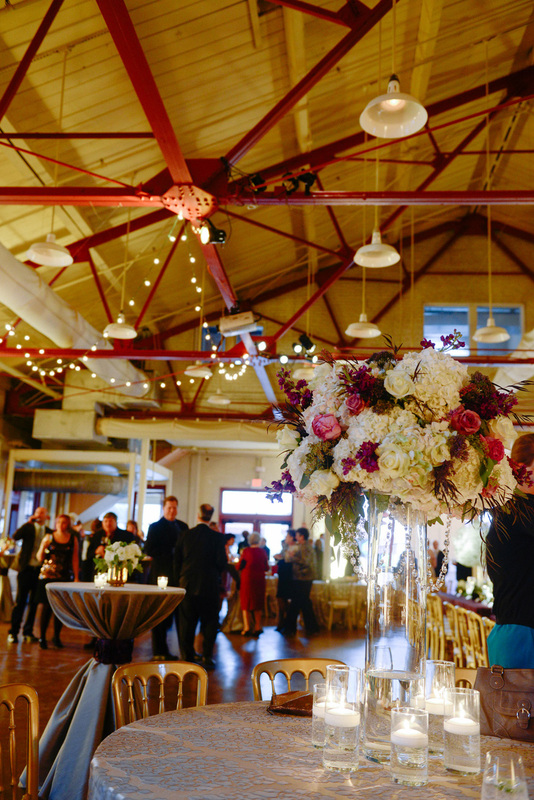 Moving to the very far side of the Cobblestone Hall, we continued to bring in height to the arrangements by utilizing 27” tall glass cylinders on three of the tables and 18” height large black lanterns on two of the tables all toped or surrounded by floral arrangements. Flowers used throughout consisted of white hydrangeas; antique hydrangeas; garden roses in varying shades of white and berry tones; stock in white, lavender and deep purple; white lisianthus; purple lisianthus; white anemones; lavender anemones; purple trachulium, gypsophila (baby’s breath); white hypericum berries; privet berries; cedar; eucalyptus; rosemary; lavender; ranunculas in shades of white and berry tones; white freesia; heather; tulips.